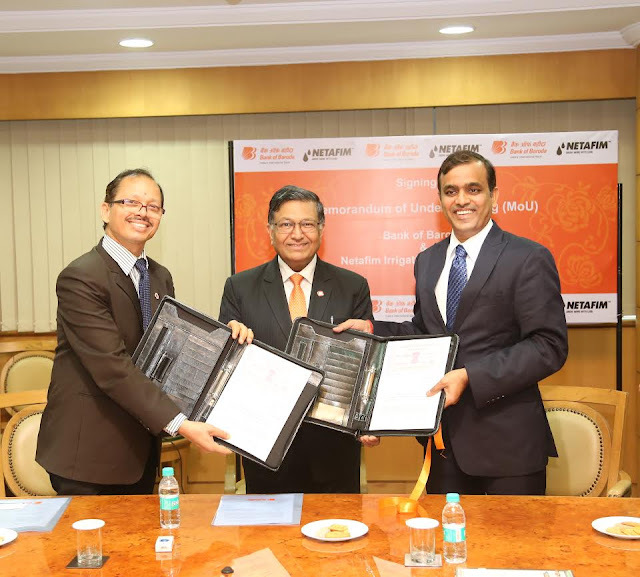 Mumbai, 3rd September 2016: Bank of Baroda, India’s leading public sector bank has entered into MOU with NETAFIM Irrigation India Pvt. Ltd with an objective to finance farmers for installation of Micro Irrigation system in their fields through our network of branches across the country. Mr. Ashok Kumar Garg, Executive Director of Bank of Baroda presided the function and Mr. G. B. Bhuyan, General Manager (Rural & Agri Banking, Financial Inclusion and CSR) exchanged MOU with Mr Randhir Chauhan, Managing Director of Netafim Irrigation India Pvt. Ltd.
On this occasion Mr. Ashok Kumar Garg, Executive Director of Bank of Baroda, said “We are delighted to partner with Netafim Irrigation India Pvt. Ltd to work jointly for the upliftment of farming community. Both Bank of Baroda and Netafim Irrigation India Pvt. Ltd are strong players in their respective fields and this relationship will manifest into win-win situation for all including the farmers”.